SACRAMENTO, CA -- Point guard Greivis Josué Vásquez Rodríguez is now a Sacramento King after a three-way deal involving Tyreke Evans, the New Orleans Pelicans and the Portland Trailblazers. 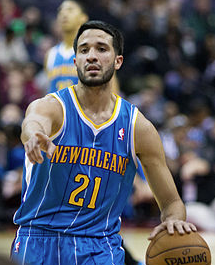 Vásquez is one of 17 Latinos playing in the NBA today. The 26-year old from Caracas, Venezuela came to the U.S. to attend high school in Rockville, Maryland and went on to play college basketball at the University of Maryland under head coach Gary Williams. In 2007, Vásquez played on the Venezuelan national basketball team in the FIBA America Championships. In his final college season of 2009–10, he was one of three Venezuelans playing in NCAA Division I men's basketball. The trade is a result of the Kings informing Evans’ agent that they would not match the offer made by the Pelicans. Evans became a free agent at the end of this past season. The Memphis Grizzlies initially drafted the 6-foot-6 Vásquez in 2010 before going to the Pelicans, where he started and had an average career high of 13.9 points and nine assists in 78 games. He was voted the second Most Improved Player last season.